The Chicago Park District Board of Commissioners unanimously voted to transfer control of parkland in Washington Park and Jackson Park to the City of Chicago on Wednesday evening. The land contains two University-proposed sites for the Obama Presidential Library. No land will actually be transferred unless UChicago's proposal is selected. The agreement has a reversionary clause, which would revert control of any land not selected back to the Park District. The Chicago City Council still has to vote to approve the land transfer. The move is an effort to shore up UChicago’s bid, which came under criticism from the Foundation because neither the University nor the City owns the land for either of the proposed sites. The Board's vice president, Avis LaVelle, said that the transfer of the land allows the city to make the strongest possible case for the library. "No decision that you make is going to make everybody happy, so we know that there will be those who leave here today entirely unhappy with what we’ve done," she said. "But what we do feel like we are doing is positioning the city as well as we can to be favorably considered in the grand sweepstakes for the Obama public library." The Board's general counsel said at the meeting that the land transfer agreement would require the City and the Obama Foundation to make their best effort to keep the footprint of the actual building at five acres or less. This requirement is not listed in the publicly available legislation text. Most presidential libraries have used up to 50 acres of land, but the buildings typically take up only around three acres. The entire site of John F. Kennedy Presidential Library and Museum, the only existing library located in a major city, covers about 10 acres in Boston's Dorchester neighborhood. Friends of the Park, a public park advocacy group in Chicago, said it is considering a lawsuit to prevent the land transfer. Park land by law must be used for a public purpose, according to Fred Bates, a lawyer and a member of the organization’s board. "Illegal is a tricky word, but it’s a good one. It would be illegal," he said. "There are certainly legal bases on which to challenge any use of park land that isn’t clearly continuing a high level of public use, and the Obama Library is in fact a private usage." While the Barack Obama Foundation, a private entity, would obtain title of the land to build the library, the administration of the library would be transferred to the National Archives and Records Administration, a public entity, once construction is completed. Bates said he is unsure how this would affect a possible lawsuit. Mayor Rahm Emanuel commended the board's vote in a statement. "I am committed to moving heaven and earth to ensure that the Obama Presidential Library makes its home on Chicago's South or West Side, not on Manhattan's Upper West Side," he said. "Today’s action by the Park District is another step toward ensuring we've met the President's request to secure the three finalist sites." The Foundation affirmed that the vote "improves Chicago’s bids for the Obama Presidential Center,” according to a statement. "We appreciate the City of Chicago’s efforts to develop a competitive and robust proposal and the engagement of the community and City Council in an open dialogue about the potential of a future Center." The 5–0 vote followed a series of community speakers at the board's regular meeting at the Jesse White Community Center on the Near North Side on Wednesday afternoon. LaVelle noted that including Wednesday's board meeting and the two community hearings in January, the board has heard about eight hours of community input on this issue. Park District President Bryan Traubert recused himself from the discussions and vote due to his ties to the Obama administration. He has raised money for President Obama and is married to Commerce Secretary Penny Pritzker. Bernita Johnson-Gabriel, the executive director of the Quad Communities Development Corporation, which works on economic development projects on the South Side, spoke in favor of the library at the vote. "What is conceivably a sliver of either park can be parlayed into a huge piece of the pie for South Side communities that have endured years of disinvestment. I appreciate the sentiment for those who have told me that parks should be off limits for the Obama Presidential Library. I do," she said. "But most likely, they have not experienced the decline and disinvestment these communities have endured. They most likely do not live in communities with double-digit unemployment, crime, and overall substandard quality of life." Hyde Park resident Robin Kaufman told the board to delay the decision and consider not transferring the land. "I beg you, I implore you: take your time. Wait until the spring. Go out and see what these parks look like, how they're used, what those trees look like. Defer your decision. Don't let other people bully you into giving away and giving up [the land]...you're entrusted with this land," she said. 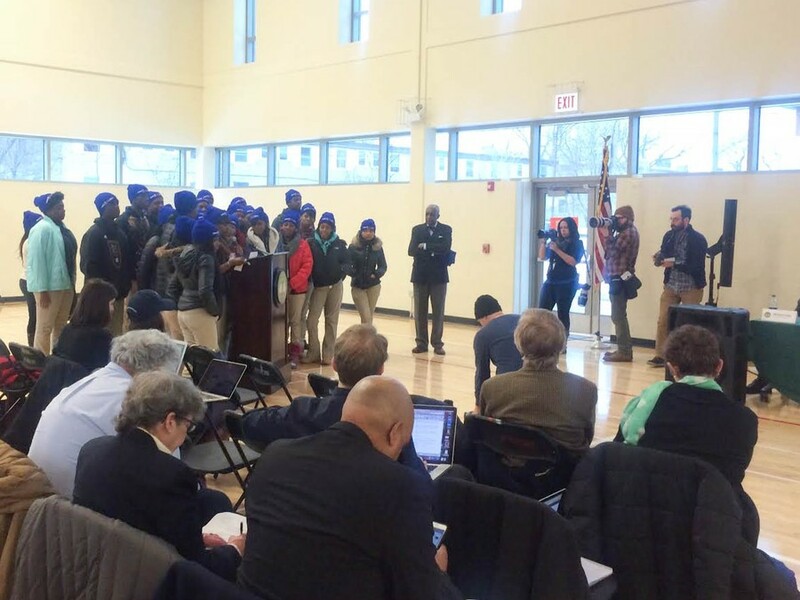 Warren Beard of the Woodlawn Community Development Corporation organized a group of high school seniors from Hyde Park Academy to attend the meeting and make a presentation in support of the library, as part of a service learning project for the students. "It was easy to convince them to come, with Hyde Park being right across the street from Jackson Park. It would be a perfect location, and it'll mainly be African-American kids taking advantage of the library," he said. "We just want it in Chicago and on the South Side. This is [Obama's] home." This article has been updated with a statement from the Obama Foundation.